Below you will find a portfolio of some of the repair work that I’ve done for clients. I don’t post every repair that I’ve completed as that would be quite boring. After the first (mostly mundane) repair of it’s type is posted, only unique repair posts will follow. Thanks for looking! Board would not boot. All controlled lamps would blink on/off continuously, a symptom typical of the processor not running. R/W signal was present at 68B09EP, but not at other peripheral devices. 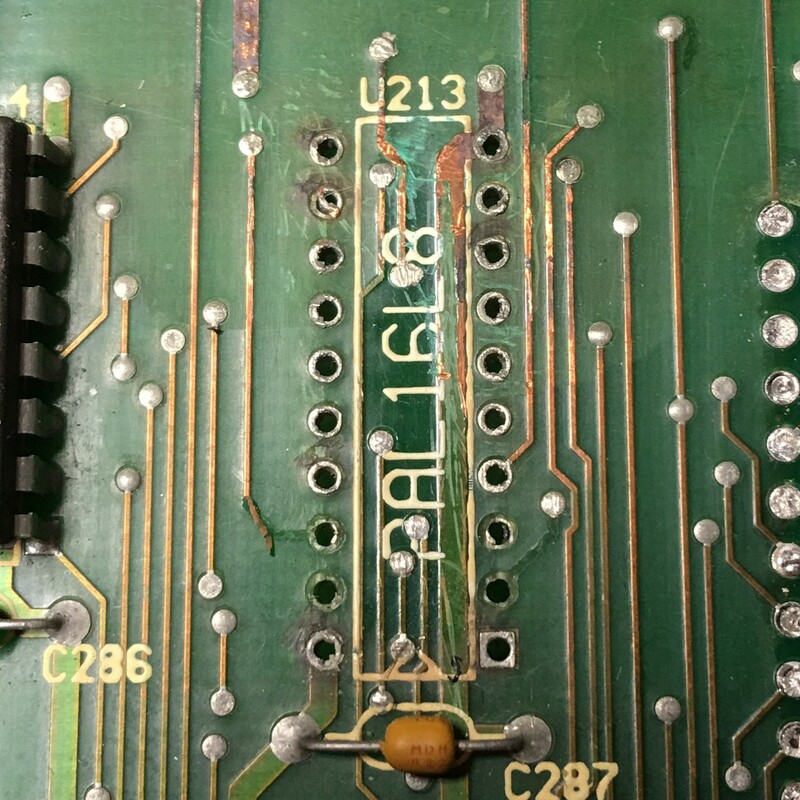 After removal of the 68B09EP chip socket, alkaline corrosion had severed the R/W trace that eminates from pin 32 to the “via” at the bottom of the socket location. Fairly typically, especially as these games age, one or more components in the high voltage generation circuit will fail or burn out. It’s advisable to simply replace the entire HV section on the board. While it’s not always necessary to replace the HV filter caps, I took care of those too. 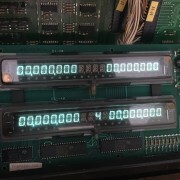 Failing HV filter caps cause the DMD display to “roll” similar to old CRTs with the vertical hold out of adjustment. The game (Mars, God of War) would periodically reset during game play. A prior attempt to rehab the power supply was performed incorrectly. 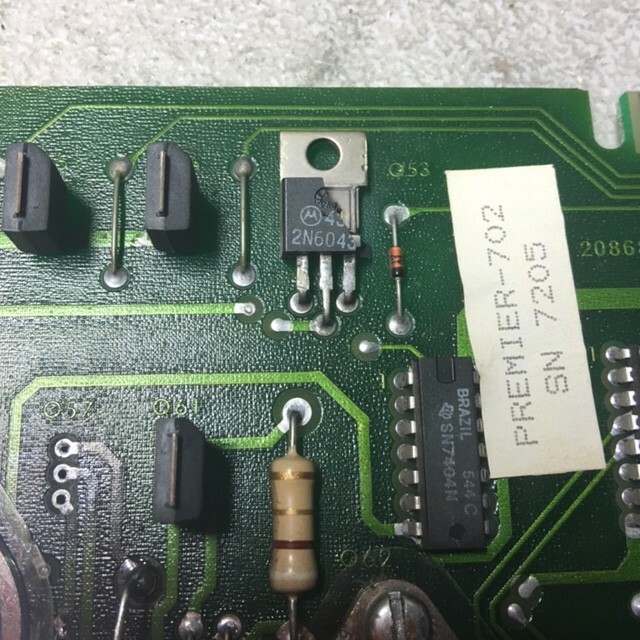 CR7 was replaced with a 1N4738 zener diode correctly, but R10 was not simultaneously replaced by a 680 ohm 1/2 watt resistor. It’s important that these two replacements occur at the same time. Additionally, the 5V trim pot had never been replaced. I replaced it with a high quality Bourn sealed pot. Also replaced were all 3 headers as some of the original pins exhibited fractured solder joints, and the 47uf/100V cap. It’s tough to say. The old NDS-U45 transistor that “chases” lamps on the playfield of many games locked on and “blowed up good”. 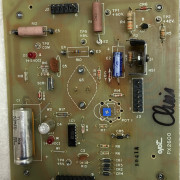 Carbon was cleaned off the board, the transistor was replaced with modern CEN-U45 equivalent, and traces were jumpered to replace traces completely burned off. Board returned to 100% working status. Remove the socket that the owner attempted to install. Clean up traces as necessary. 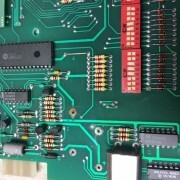 Install machine pin “SIP” sockets which allow more reliable board solder connections. 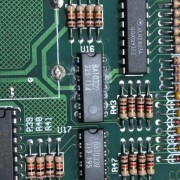 Jumper traces to repair previously damaged connections. 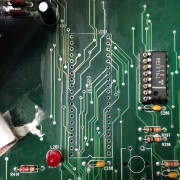 Board returned to service, working 100%. GI and all power headers replaced. 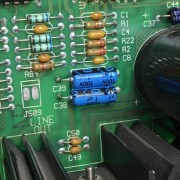 Capacitors C2, C4, and C5 replaced, all for long term reliability. 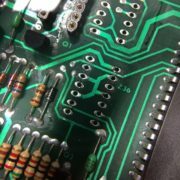 I test WPC power/driver boards in my Twilight Zone. My game has the 9.4H home ROM which allows the LITZ cheat. 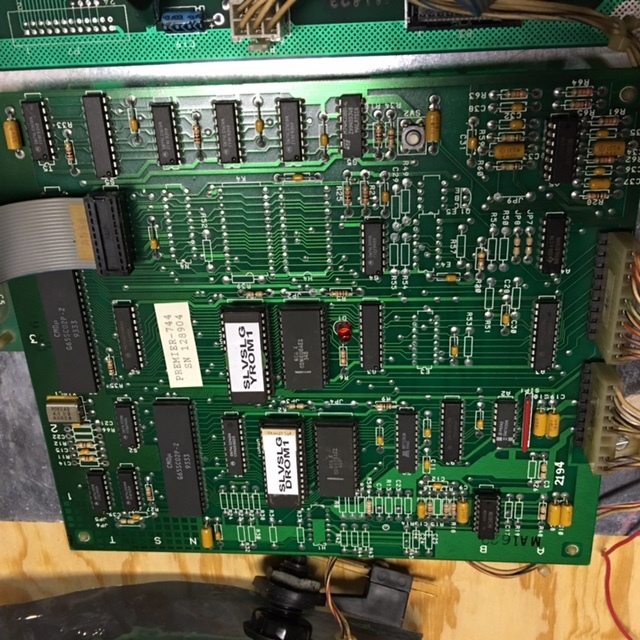 If the power/driver board doesn’t reset during LITZ, it’s good to go in any game. Board would boot irregularly. When it would boot, it would lock up randomly, even when only playing the sound test tones. 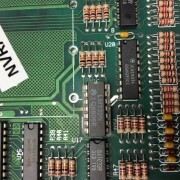 Both of the 6116 RAM chips on the board had failed. There is no good way to reliably tell if the RAM has failed. Even diode test doesn’t help much with the RAM on this board. 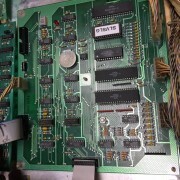 Both RAM were socketed and the board returned to proper operation. Alkaline damage. The bane of all pinball owners. 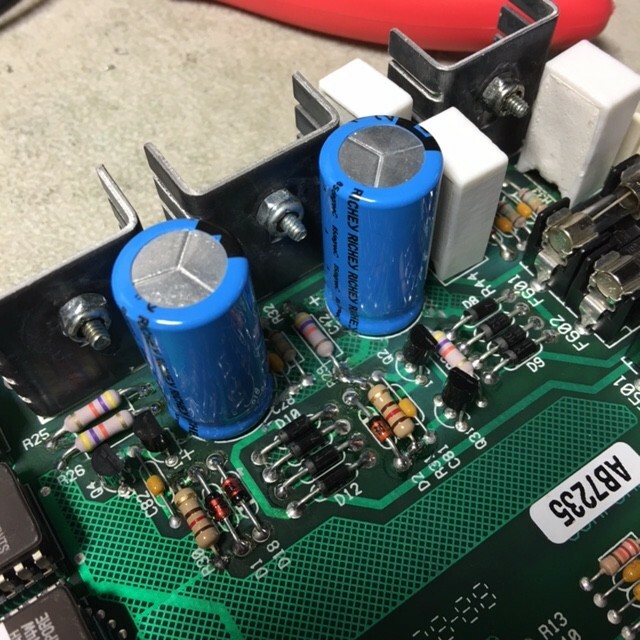 The original NiCad battery should have been removed long before the board made it to my shop. 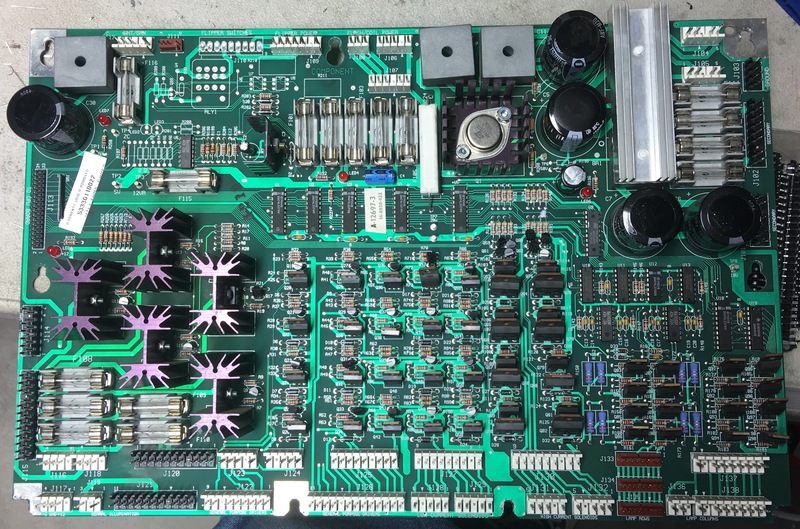 Remove all corroded parts, clean alkaline corrosion, tin the bare copper traces, and replace parts. While I was at it, I added the ground updates to the board. I don’t see many display boards come in. They sort of work or they don’t. 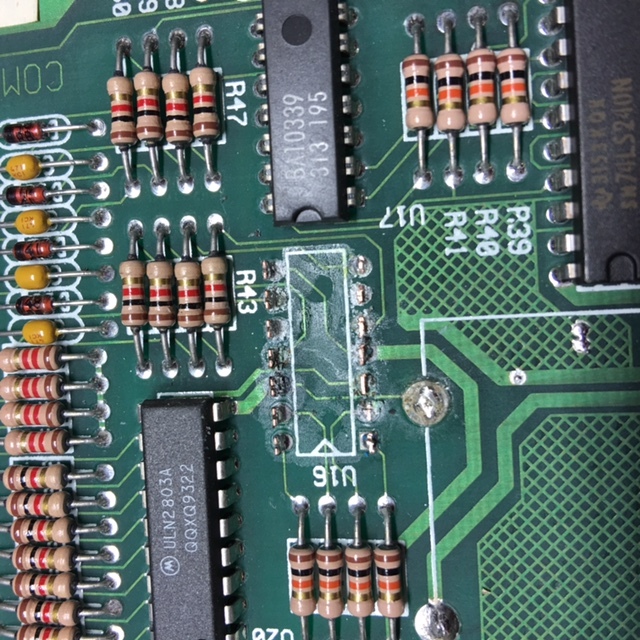 If the problem can be determined to be one of the chips and not the display glass itself, display boards are entirely repairable. The 7432 on the board had failed in such a way that segment “c” was always locked on. 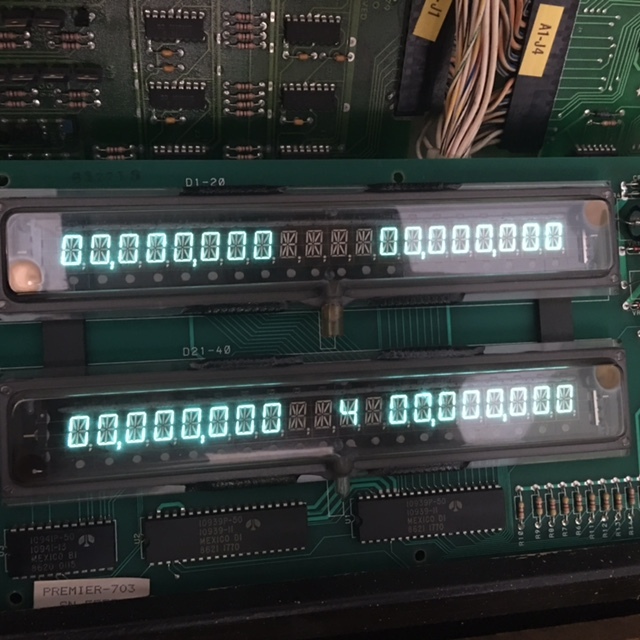 I installed a socket and replaced the 7432, returning the display board to proper operation. 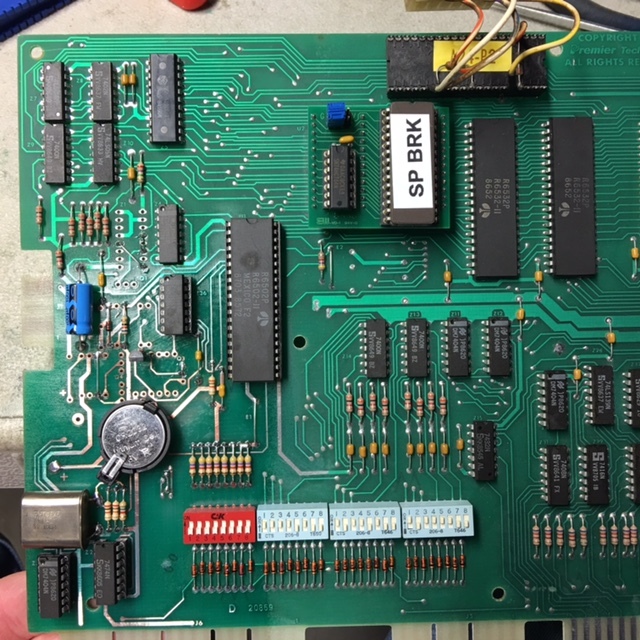 This MPU board refused to boot. 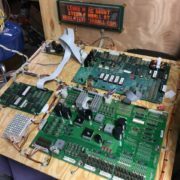 System 3 boards don’t provide any diagnostic information at all. 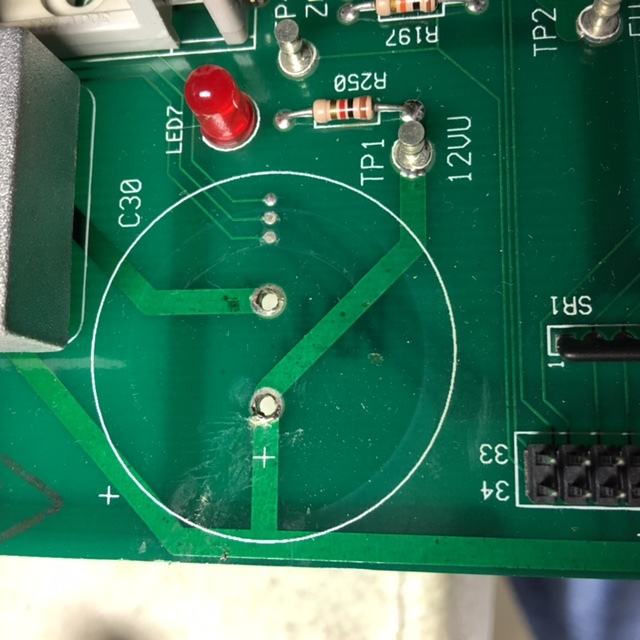 It’s a matter of probing around and diode testing until something out of normal can be found. 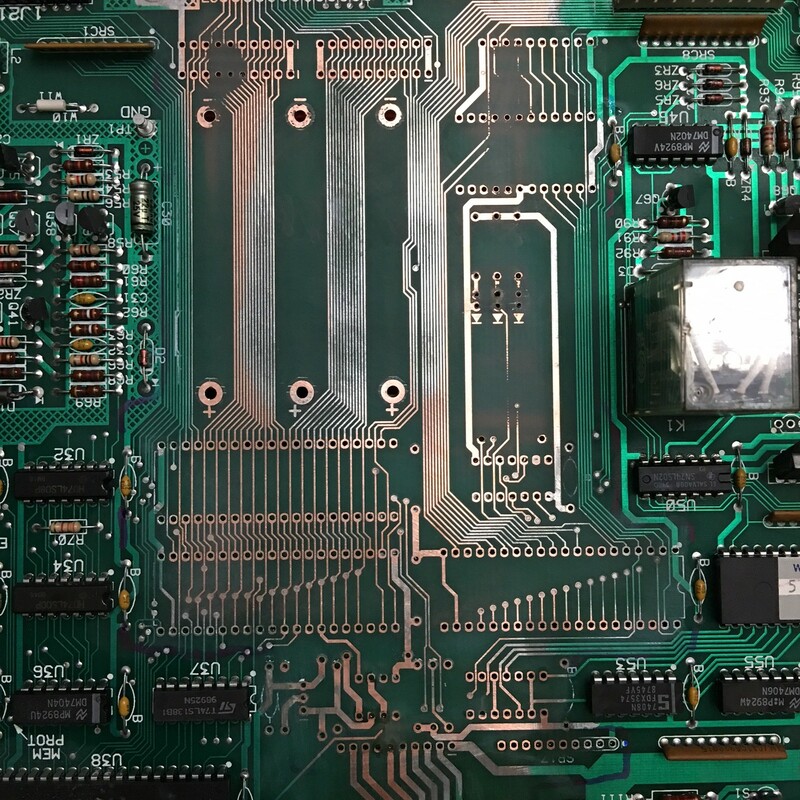 In this case, the 74HCT139 at U10 had failed, causing the watchdog circuit to reset the processor continuously. 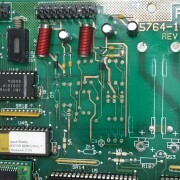 Generally, if the predominant failure cuases on a Squawk and Talk board are addressed (caps, chip sockets) the boards just run. It’s a beefy board with fat traces that are easy to work on. 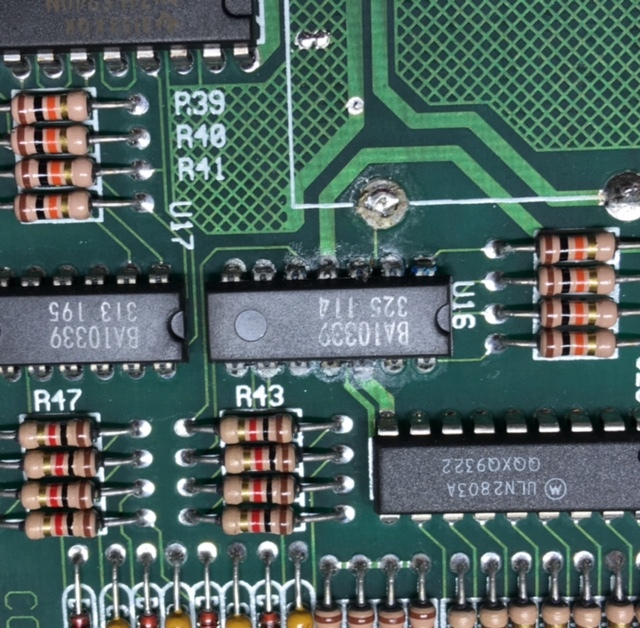 Care must be taken when removing jumpers as the solder pads can be lifted easily. The client sent this board because it wasn’t booting in their game. 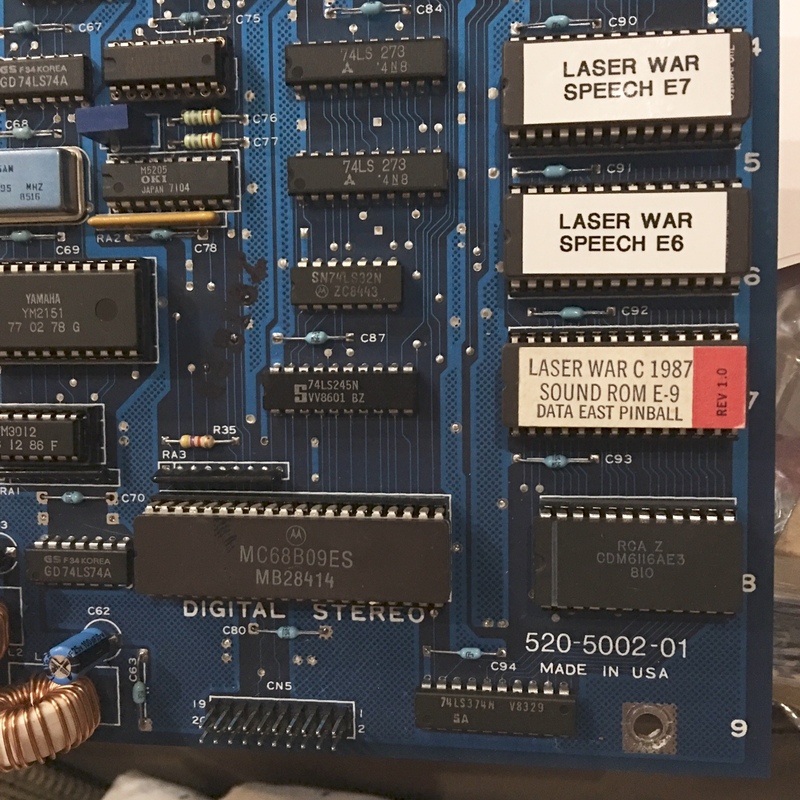 The client also agreed that replacing the OEM daughter card with the re-engineered version from Great Plains Electronics (which is a much better implementation) was a good idea. 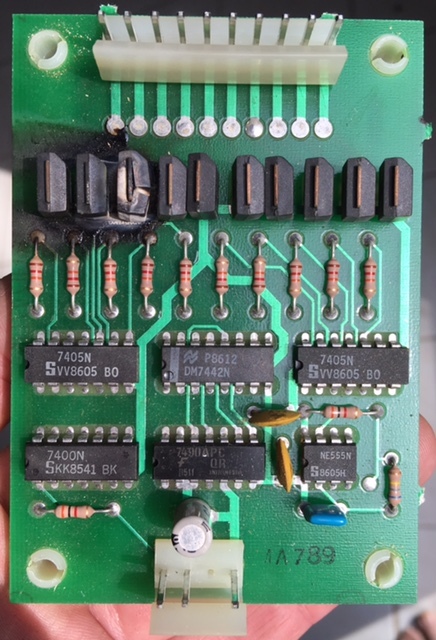 Upon arrival, it was clear that the board had suffered a significant amount of alkaline corrosion from the original NiCad battery. Argh…. Attacking the alkaline corrosion was the first order of business. Abating alkaline corrosion is laborious and tedious. Yet, it must be done. Like cancer, if a small amount of corrosion remains, it will spread. Quite a few parts had to be removed and/or replaced. 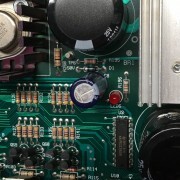 I like to use the Dallas Maxim reset generator in place of the OEM reset circuitry. This reduces the parts count tremendously. After cleaning up the traces, they must be sealed to prevent copper oxidation. I use an acrylic encapsulant to achieve this. Lastly, the failed 6532 RIOT at U5 was socketed and replaced. Board tested 100% in my Hollywood Heat. That’s right baby….Hollywood Heat! 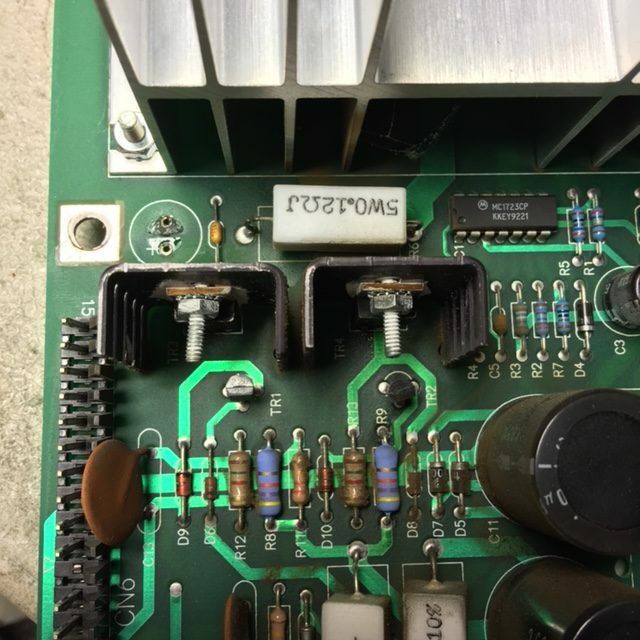 The patron had attempted to replace all 5 of the 15,000uf filter capacitors on the board. Without the right tools, technique, and experience, he pulled every through hole; all 10 of them. Ouch! 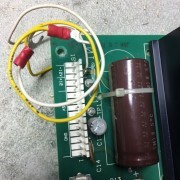 All of the capacitors were removed and the through hole examined. Once determining that every single one of them had been pulled, I used the “solder stitch” technique to repair the through hole. 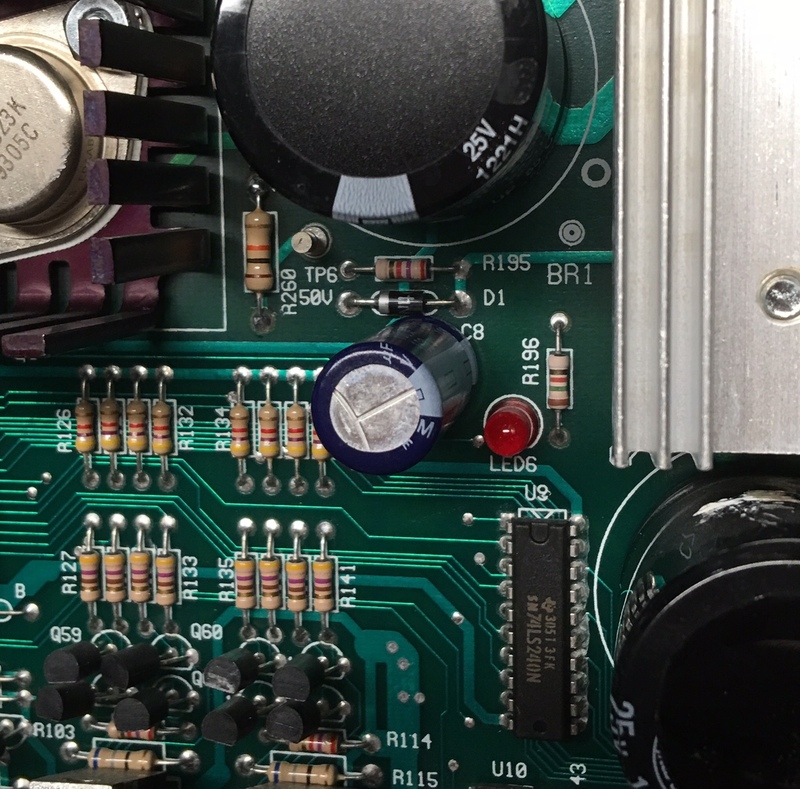 I like this technique since it returns the board to it’s original configuration without the need for (IMHO) ugly jumpers between the capacitors and the bridge rectifiers. After repairing the through holes, replacing C4 and C2 for reliability, and replacing the power headers, the board played flawlessly in my test game, Twilight Zone. 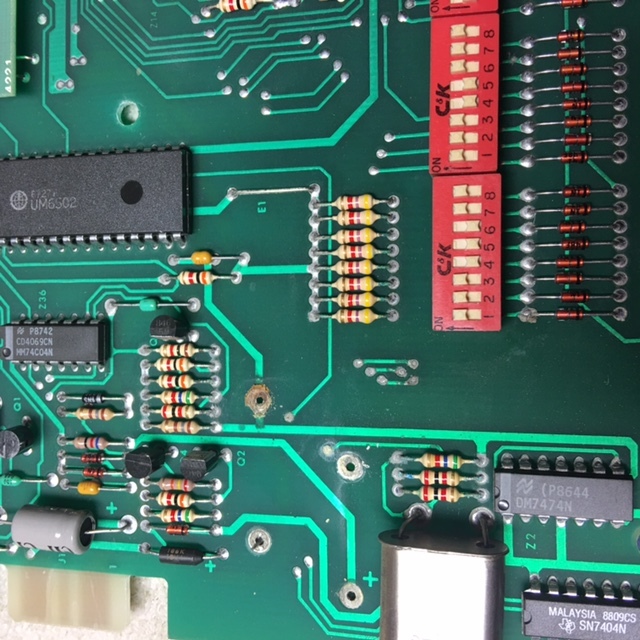 I play a round of LITZ (I have the 9.4h ROMs that feature the LITZ cheat) with each board. If it withstands LITZ action, it can survive anything. Of course, I test all coil, motor, GI, and controlled lamp function too. I’ve needed/wanted a WhtieStar test rig for some time since I don’t like using my minty Sopranos as a test bed. The build out was a bit more tedious than I thought it would be, hence the long period since logging repairs. I build the wire harness from scratch. Chuck at CP Pinball supplied the transformer. I sourced the boards over time from various places. The lamp matrix was a custom build using 5×8 blocks my bud Jim Palson found for us. It’s good to have friends! 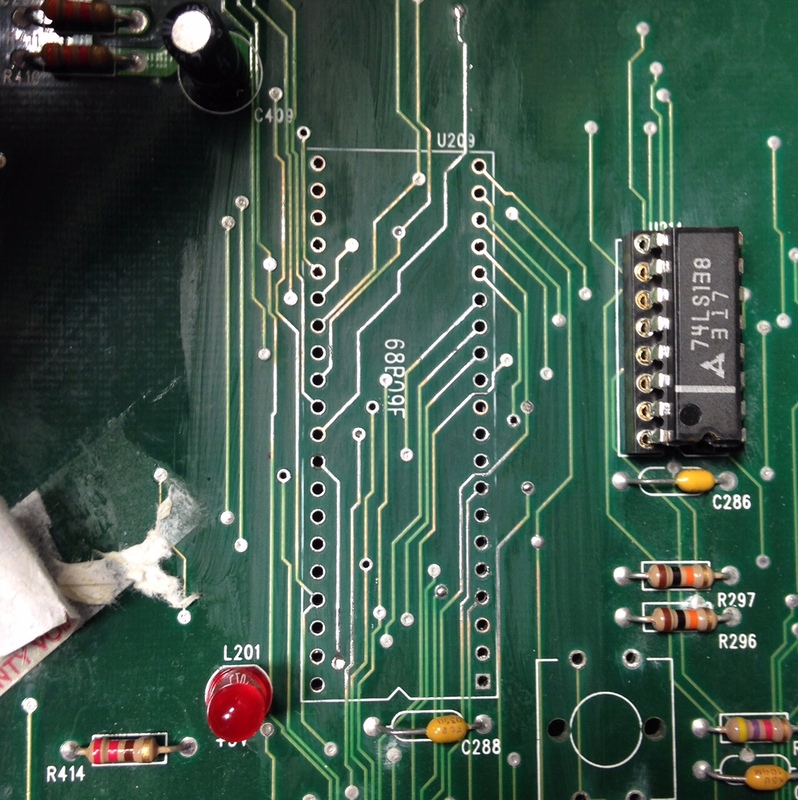 The PPB board was straighforward. As you can see in the pic, someone had used the old technique of soldering the new part to the cut off legs of the old part. I’m told this repair technique was used on old computers. The Power Supply exhibited no/low 5VDC. This prevents the MPU from booting. I replaced C2 as a matter of course as they often leak. C7 was the root cause on this PS though. Being leaky, it was causing a short across the circuit. 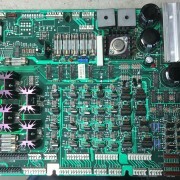 After cleaning it up and replacing the cap, the board was returned to normal service. This one was a bit of a booger. The board didn’t want to boot. Someone had socketed a couple of the ICs previously. 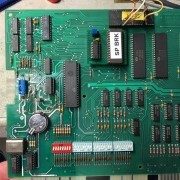 The odd thing about this board is that it worked perfectly using the Pinitech Piggydeux board (http://www.pinitech.com/lab/gottlieb_sys80_piggydeux.php). But with the daughter card installed, no joy. 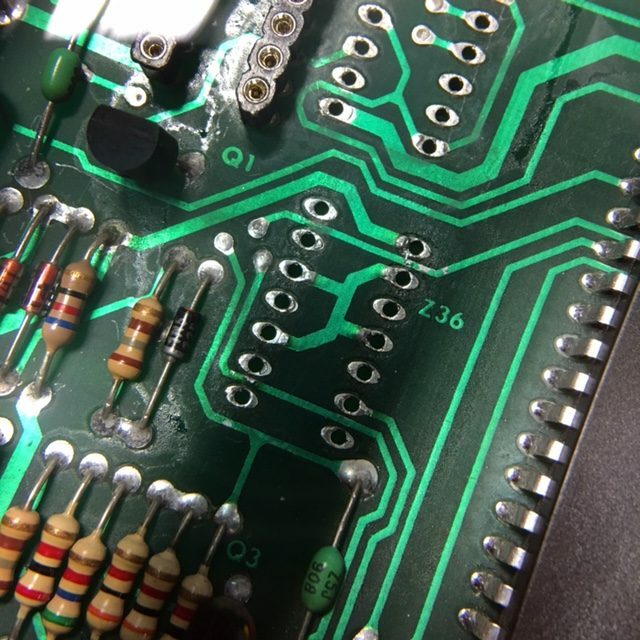 After quite a bit of scratching my head, I found that pin 14 of Z36 was shorted to the trace right next to it via solder bridge. Cleaning the bridge up and replacing the socket returned the board to normal service. I always tell myself…suspect prior rework. 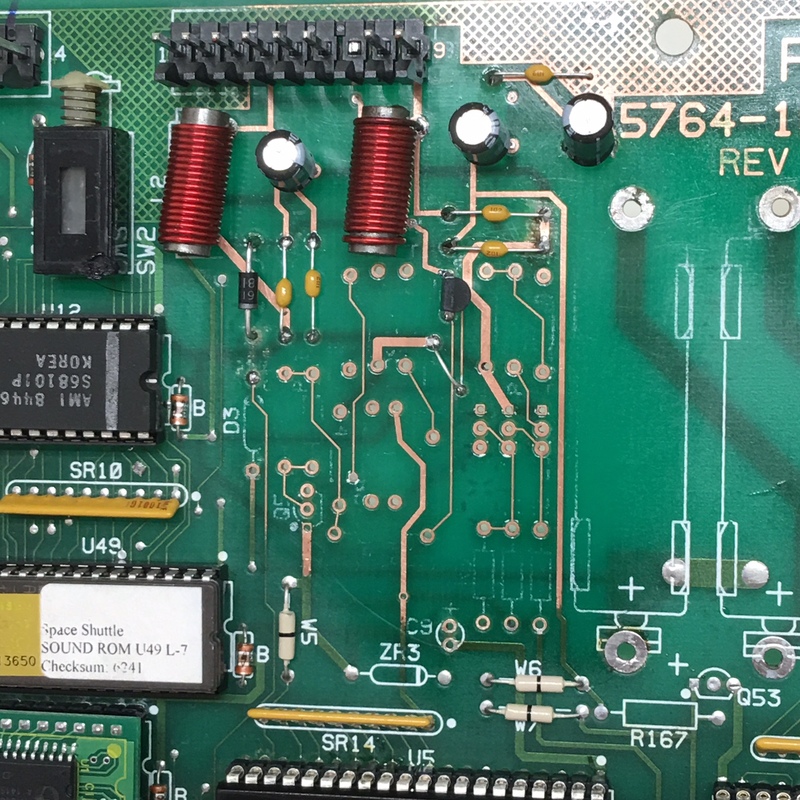 The 2N6043 on this driver board drives the knocker coil on the game. 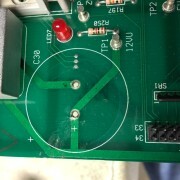 Either this transistor shorted, or the coil shorted, or the diode on the coil shorted, or someone connected the wires to the coil backwards (path to ground should connect to the non-banded side of the diode). Whatever happened, over time, this 2N6043 gave up the ghost. Fortunately, a much cheaper TIP-102 is a great substitute for the 2N6043. All better now. 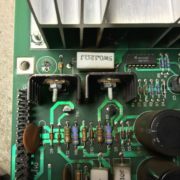 A bit of a hack on this Jokerz power supply. 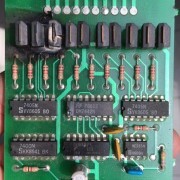 Some time in the past, the 12V bridge failed open. 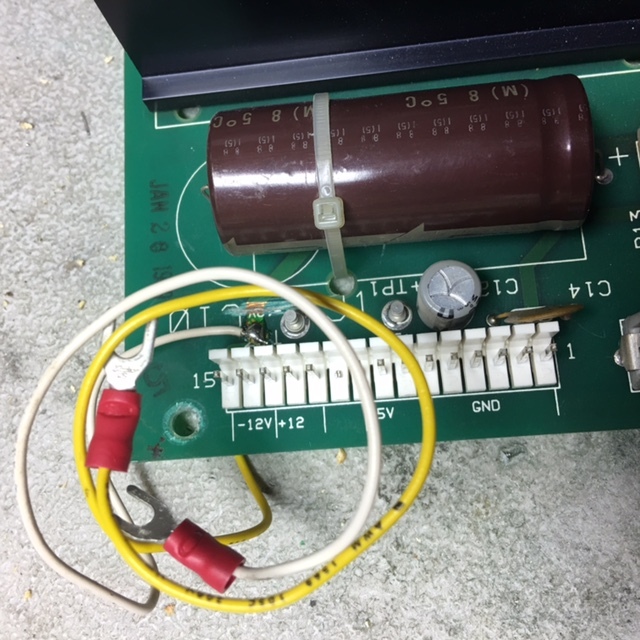 The “tech” knew enough to detect the problem, but instead of fixing it right, he severed the traces to both the plus and minus 12V header pins then tack soldered two wires to connect to a video game power supply. Hack removed. Traces rebuilt. Power supply returned to normal service. Get rid of that NiCad battery! All batteries leak. It’s just a matter of time. 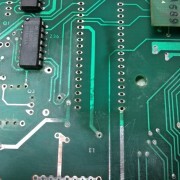 The corrosion had reached under the 6502 processor. The processor had to be removed, cleaned up, and socketed. 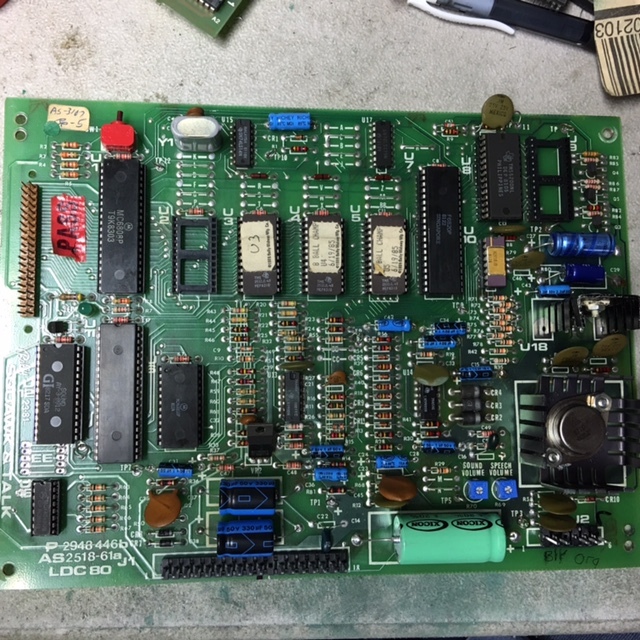 Along the way, I removed the daughter card, addressed fractured solder joints, and reinstalled the card. A SuperCap to retain memory completed the job. BTW…all those pulled eyelets were done by the prior “tech”. Each sound lane has it’s own TDA2030 amplifier and associated circuitry. A component that is always suspect are these two 1uf/63V capacitors that are “in series” of the sound circuit. Replacing these caps returned the board to normal function. Here we have another case of leaky batteries. This time on a WPC MPU from a Judge Dredd. 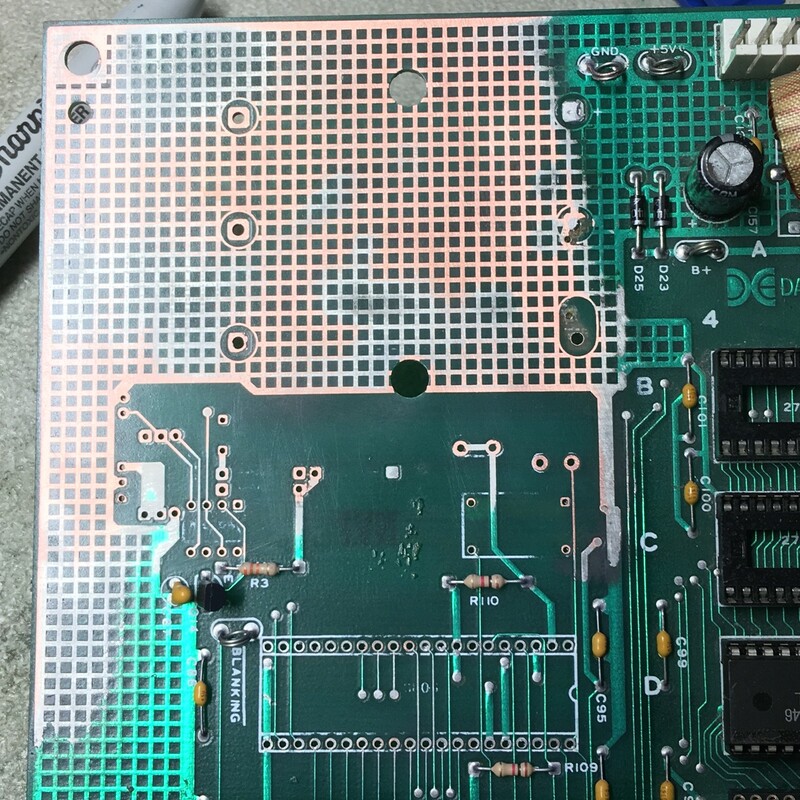 The corrosion wasn’t too bad on this particular board but U16 still needed to be removed, alkaline cleaned up, traces tinned, socket installed, and a new LM339 installed. 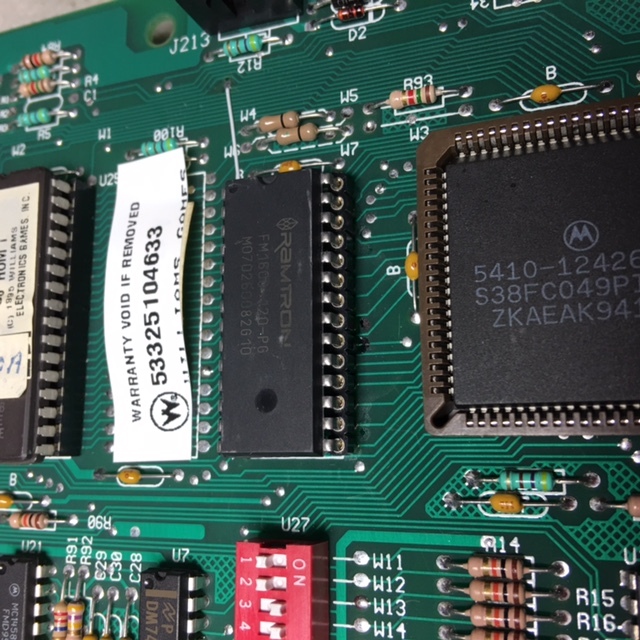 While in the shop, a 6264 NVRAM was installed too. “50 years for not removing batteries”. 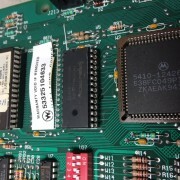 Williams placed a sticker on the DMD Controller RAM chip that contained the serial number of the board. In this case, it also acted like heat sensitive paper. It takes a lot of heat to burn that label. 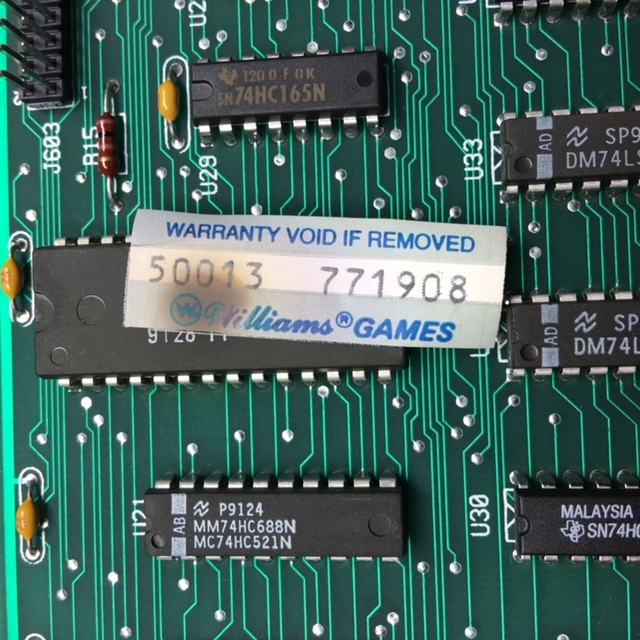 The board wouldn’t display anything at all on the DMD, which would have made diagnosis a bit tough were it not for the burned label. 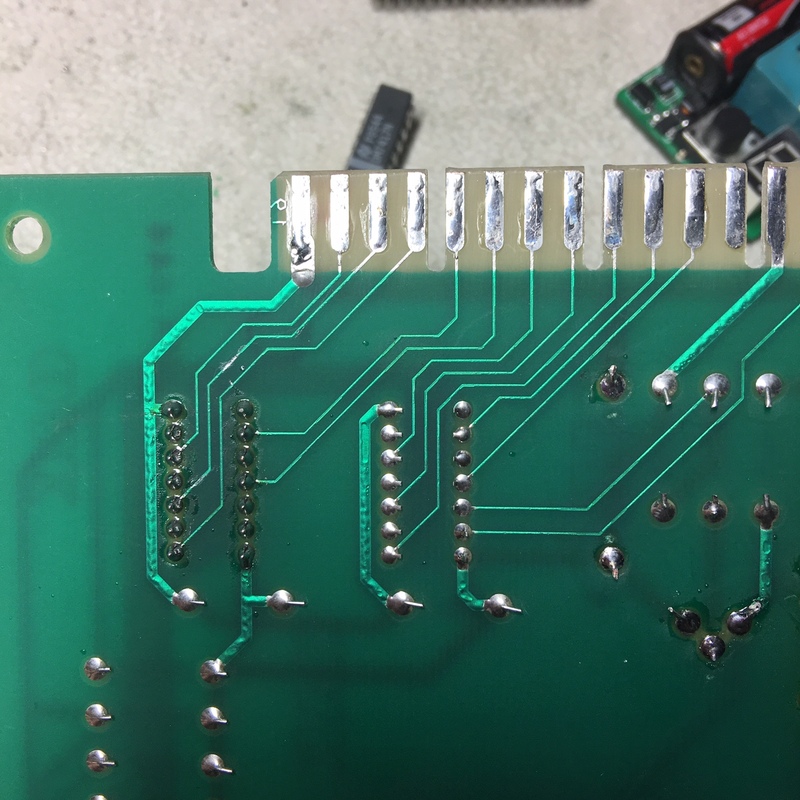 In addition to rectifying a few “hacks” in the HV section, replacing this RAM chip returned the board to perfect working order. 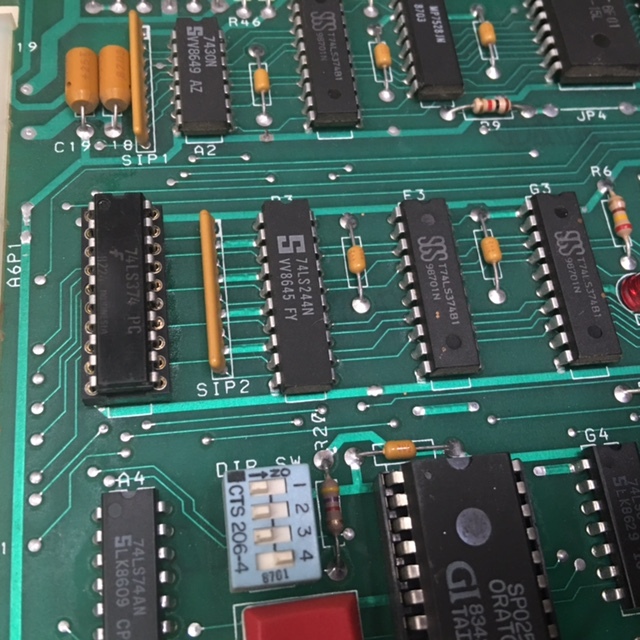 System 80B displays are, in mind, pretty cool looking. Once in a while, they won’t light up at all. Power is sometimes a problem. 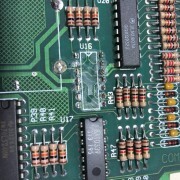 The glass and the “unobtanium” ICs on the board don’t fail very often. This one, was missing one of the data signals from the MPU. 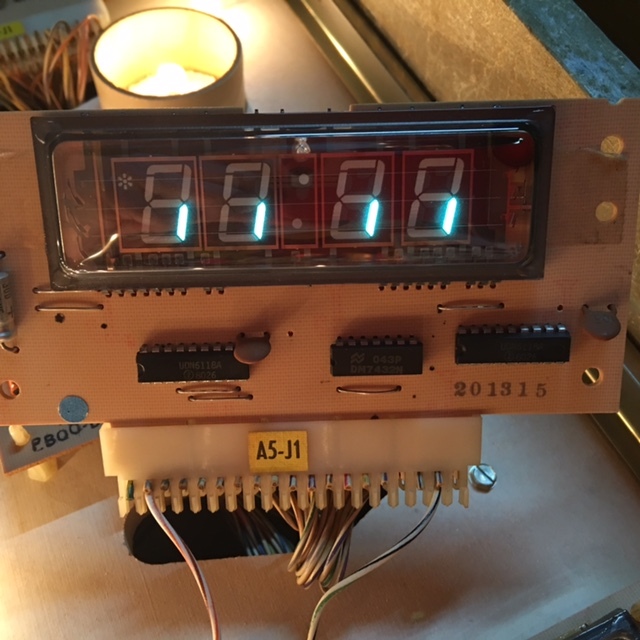 My bud Jim Palson theorized that if ANY of the data signals is missing, the display won’t work. He was right. 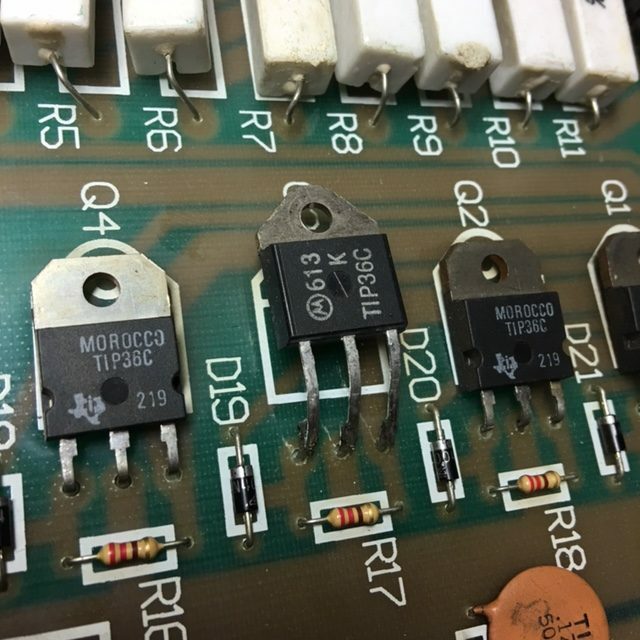 The root cause for the missing signal was corrosion on the edge connector solder pad, much like the “divots” in Williams WPC lamp boards. This time on a tough to replace System 9 MPU. The original problem was lack of sound. I corrected that but couldn’t let the board out of the shop without abating the alkaline corrosion. 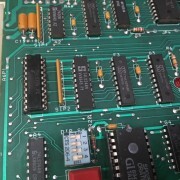 The image at left shows the reset section, using a more modern reset generator. As can be seen, many parts become unnecessary using this technique. 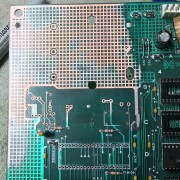 WhiteStar MPU boards are very expensive to replace. This makes it cost effective to spend quite a bit of time abating alkaline corrosion. This one wasn’t too bad. I’m glad the owner sent the board when he did! I’m beginning to detect a theme. 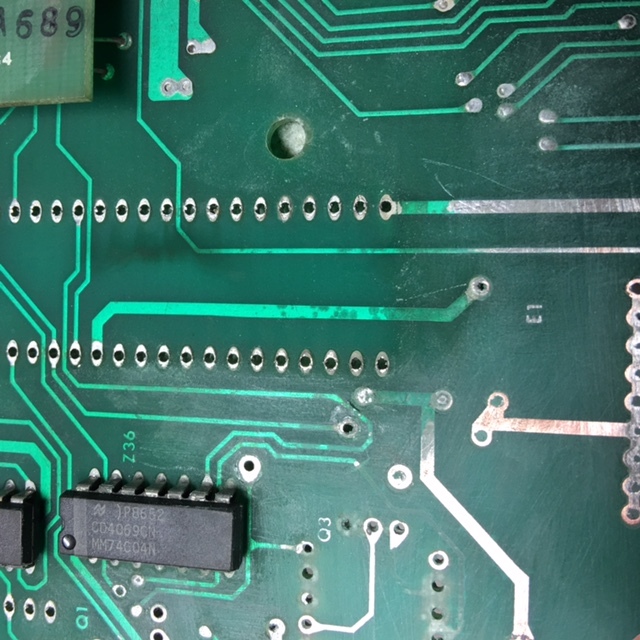 Of all the boards that suffer from alkaline corrosion, Data East boards are the easiest to correct. 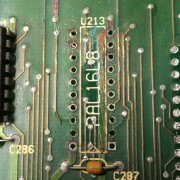 This one required removal of quite a few parts but the traces weren’t too bad. 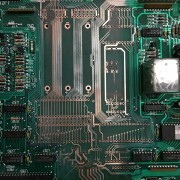 This board, like many I show on this page, was sealed with an “encapsulant” which prevents the bare copper from oxidizing. Sometimes I get to work on my own things. I needed a quick and compact way to test the GI circuits on WhiteStar power/driver boards. 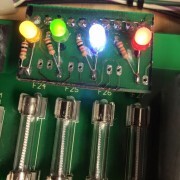 Using a scrap classic Bally display board, I soldered a bottom entry connector to the board along with four different colored LEDs. The blue LED burns brighter with the same current limiting resistor as the other LEDs. I toned it down with a 4.7K ohm resistor. Alkaline corroded boards take so much effort to repair properly, I really shouldn’t be taking these on. But, sometimes I just can’t say no. 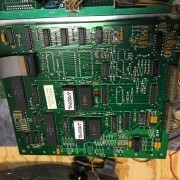 The picture shows the board mid repair. 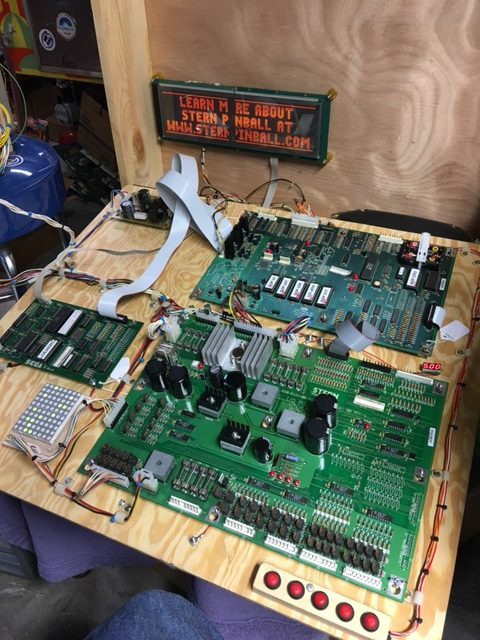 Once the parts were removed, a vinegar/water rinsing, a little more cleanup, and then sealing with an encapsulant, it was time to repopulate the board. Quite a few traces had to be rebuilt. Good news…everything works perfectly now. 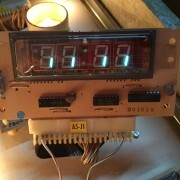 Here’s a YouTube video of the board being tested. 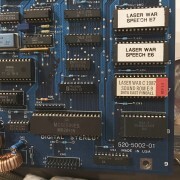 This board was sent to me because the GI circuits were quite crispy. 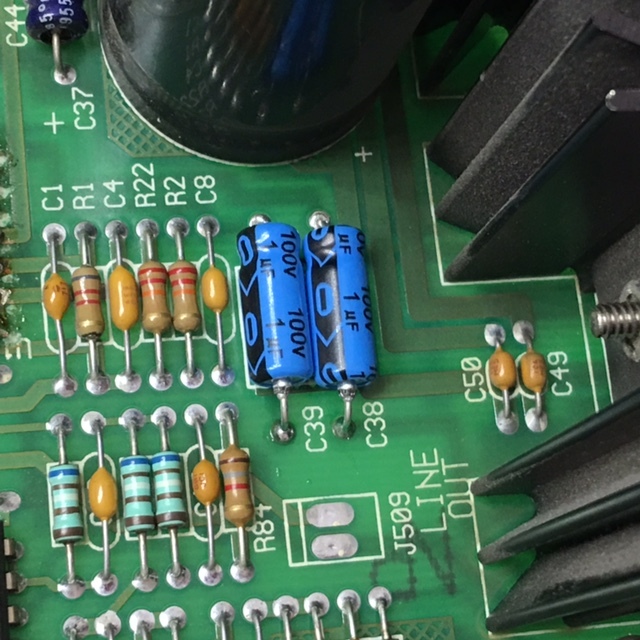 After correcting the GI issues and rehabbing the 5VDC power path, I tested the board and found that the nominal 75VDC was only at about 42VDC. Replacement of the pictured filter cap returned the board to factory spec. This sound board showed no signs of life at all. 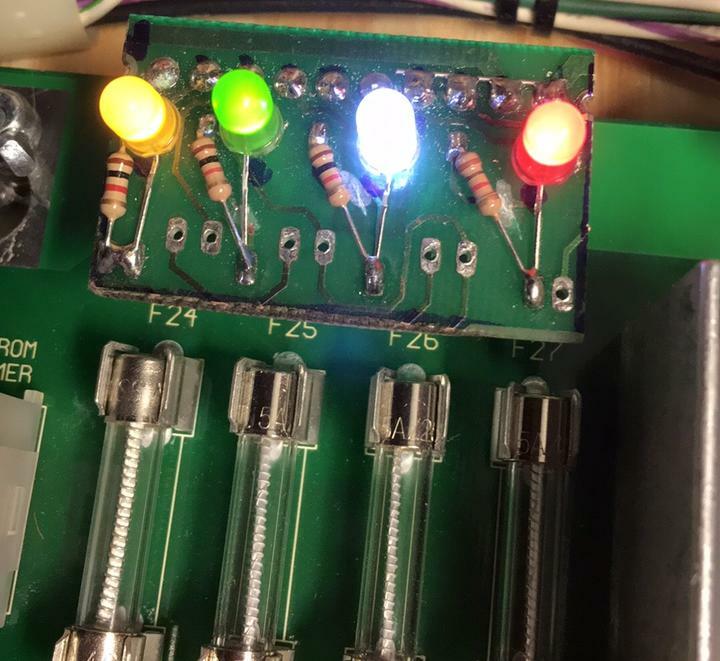 Normal boot operation is for the board to make a single “squeak” and then the LED will begin to blink. The root cause on this one was fairly straightforward to find. 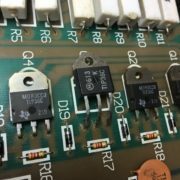 The 74LS374 I/O buffer IC had failed shorted. 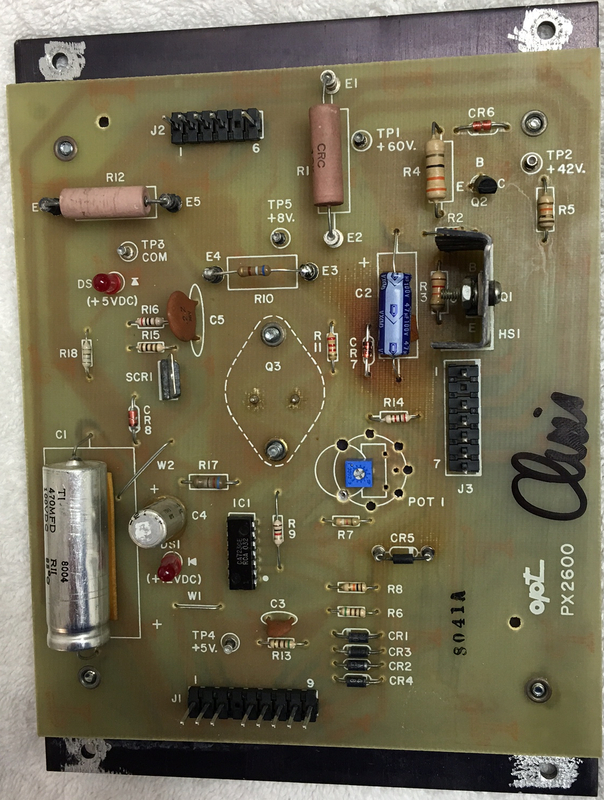 This board presented with the voice call outs making only a “ticking” sound. Sounds were fine but no joy with the voices. 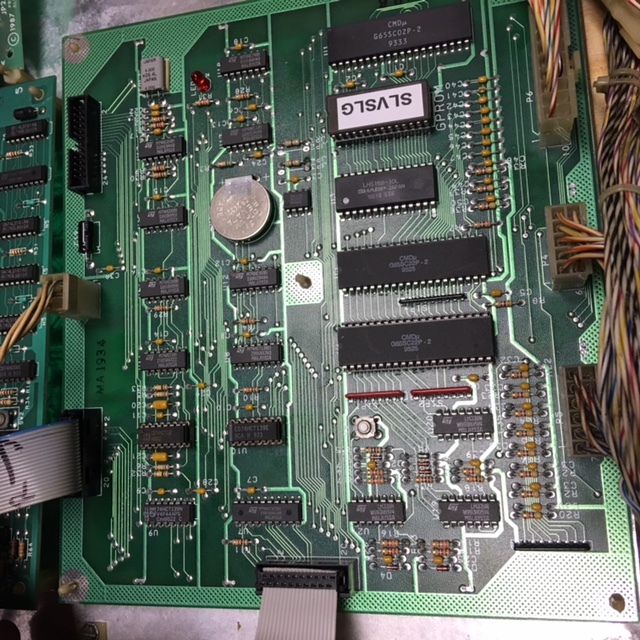 A failed LS157 was most of the issue, but an intermittent RAM would then cause the board to fail to boot about 1 time out of 6. 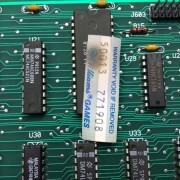 The RAM tested good on my RAM tester but was flakey in the board. Replaced the RAM….good to go.